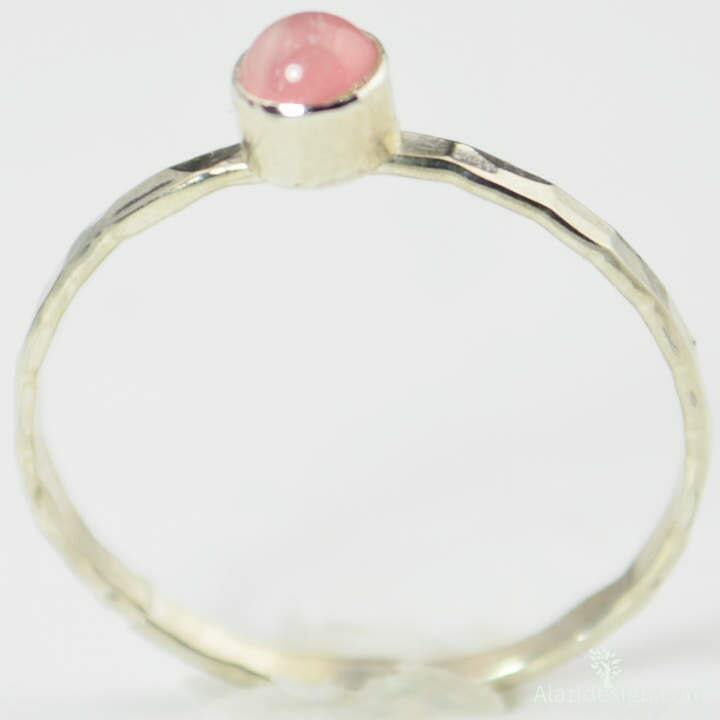 This small rose quartz ring gives just a subtle flash of silver and pink. This thin pure silver band is set with a 4mm Natural Rose Quartz Cabochon. This pink ring is beautifully worn alone or worn together in clusters with my other stacking rings. These are great "I love You" rings, or bridal gifts! These rings make a beautiful birthday or holiday gift! Rose quartz is associated with love, the heart and beauty, and is thought to be a healing aid for the heart chakra. Imbalances of this chakra have been said to cause colds, allergies and psychosomatic illnesses. When in balance, the heart chakra is thought to make one open to love and compassion. Some believe that rose quartz has calming effects and helps people develop strong friendships. I hand make each ring to order out of of .999% pure silver, or as it is called in the industry “Fine Silver”. Fine silver is slow to tarnish and therefore is amazing material to create jewelry with. Sterling Silver is only .925% Silver with the rest usually being copper. After I fuse your ring I hammer it to size, creating dozens of shiny facets that sparkle as you move, i add the bezel then tumble it to harden the metal so it will be as tough as such a small beautiful ring can be. I set the stone, and finally give the ring a final polish and get it ready to be packaged to you! •Each band is about 1.50 mm wide and .85 mm thick. • The rings are light with a stone weigh less than a gram. Very pretty little thing! So delicate and minimal design. Happy to own it!